Chiasso Coffee Roasters | Try our delicious coffee beans by ordering online. Wholesale coffee supplies available NZ wide. Everything you need to make great coffee! A profile of Chiasso.co.nz was found on the social network Facebook. The web server with the IP-address 120.138.28.102 used by Chiasso.co.nz is owned by SiteHost New Zealand and is located in Auckland, New Zealand. This web server runs a few other websites, mostly in the english language. 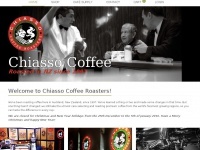 The websites of Chiasso.co.nz are served by a Microsoft-IIS server. The content management system DotNetNuke is used. The markup language of the website is XHTML 1.0 Transitional. The website does not specify details about the inclusion of its content in search engines. For this reason the content will be included by search engines.